Best Buy is reducing support for CDs and DVDs in favor of pre-owned videogames and new videogame platforms. Electronics giant Best Buy was once known for its massive CD section, but those days are coming to an end. The retailer recently announced plans to reduce various underperforming sections such as CDs and DVDs in favor of those that show potential, including videogames. 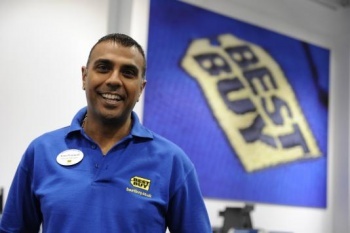 "Best Buy has recognized for quite awhile that CDs and DVDs are going away, and they have huge chunks of the stores devoted to them," analyst Andy Hargreaves told Daily Finance. On a conference call, Best Buy Chief Executive Brian Dunn said the retailer would be putting "a heavy emphasis on new gaming platforms and pre-owned game titles." Best Buy implemented its program to get into the used games business - currently ruled by GameStop - in 600 stores last month. Once it builds up the proper inventory, Best Buy will be trying its hand at the lucrative opportunity. Traditionally, 20% of Best Buy floorspace was allocated to CDs and DVDs, but the company has slowly been realizing that videogames hold more potential. "They tried selling guitars in that space when Rock Band and Guitar Hero were hot," Hargreaves added. Motion gaming will also be a focus for Best Buy, with PlayStation Move released last week and Microsoft's Kinect launch expected to be huge in November. Motion gaming requires demo space to be effective, and Best Buy plans to make it available. Despite a current level of profitability, videogames might be the key product that could help Best Buy from going the way of Circuit City in the future. Whether or not it can take a cut of the used games market is unsure, but making room for more videogames isn't a bad idea anyway.